Earlier Outlook versions seemed to offer to disable add-ins without reason. By contrast, Outlook 2013 actually tells you why it suggests to disable a certain add-in. In some cases, the add-in may simple be incompatible with Outlook 2013. But, in most cases, Outlook simply calculates that the given add-in slows down the Outlook start-up procedure and so it offers to disable it. It surely isn’t a bullet-proof procedure (since some add-ins may actually require time to gather the data needed to function properly), but at least it’s a start and you are given a reason. The down side is that – by playing with the add-in loading times – we could notice that Outlook 2013 offers to disable an add-in even if it only slightly slows down the Outlook loading time. For example, Auto Reply Manager reportedly takes 0,234 seconds to load, yet the system considers that it causes Outlook to slow down. Really? 0,234 seconds is slowing down Outlook? Anyway, the point is simple: don’t take these add-in disable suggestions for granted. If Outlook doesn’t report some really long add-in loading periods, there is no practical reason for you to disable such add-ins because they simply don’t make any difference in the actual Outlook loading times. Unless you can really feel when Outlook loads 0,234 seconds faster! Please note that this window will ONLY show those ‘troubled’ add-ins that Outlook 2013 considers to require your attention. 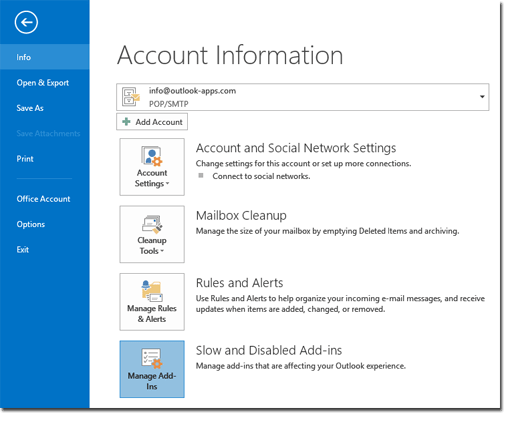 If you are looking to get a list of all installed add-ins, you can still use the old way to access add-ins: from the Outlook File menu, go to Options -> Add-ins: this view will show all active, inactive & disabled add-ins. What if my disabled add-in is not listed in the “Slow and Disabled Add-ins” section? After you click on the Go button, Outlook will display a list of all disabled Outlook add-ins. 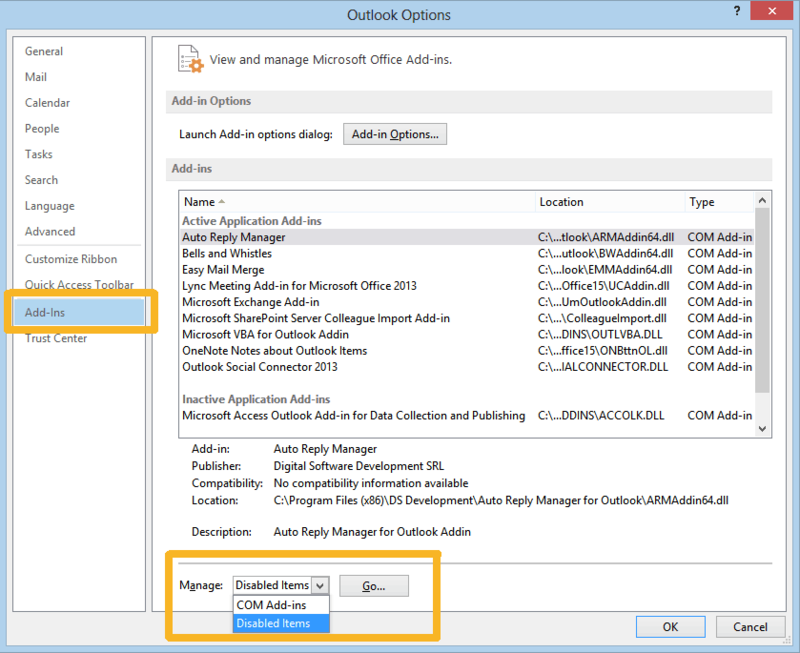 Select the one that you wish to enable, mark / tick its box, then click on OK until you exit your Outlook options window. Then restart Outlook: the selected add-in should now be loaded properly. 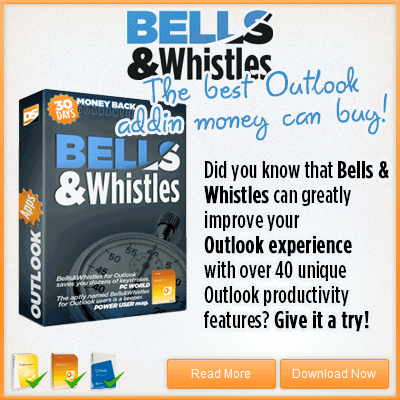 If you are an Outlook add-ins user, you should give a try to Bells & Whistles for Outlook: this Outlook add-in features several productivity features that will surely make your Outlook life easier! Slow and Disabled Add-ins button doesn’t show in my outlook 2013. However I clicked the “Disable this add-on”, but now I need it back. I’ve uninstalled the add-on and re-installed, but when I got to Options->Add-ins->Manage Comm-Addins its disabled. Even when I re-enable it automatically disables. So I can’t see anyway of getting my add-on back.. any suggestions? “Slow and Disabled Add-ins” button doesn’t show in my outlook 2013. Does anybody know from where can I enable this option? I did custom installation of Office 2013, could it be the problem? I believe, this menu can solve my problem. I have a plugin installed, it is under active add-in list, but somehow, the menu that is supposed to be there, is not loaded! To get that menu, I have to disable my plugin(from active addin list) and then need to enable it again to have my menu. And I have to follow this procedure every time I launch the Outlook 2013! This is frustrating!! Could anyone help me have this button enable?? Please note that the Slow & Disabled Add-ins icon / option is displayed by MS Outlook ONLY IF it actually disabled an add-in because it was running slow. If it didn’t disable any add-ins this way, the Slow & Disabled Add-ins option is hidden by Outlook. How does $30 qualify as “FREE”? The issue I am having with add-ins is that once made active, they do not launch the next time I start the program. The revert back to the “in-active” group. How do I make it permanently active? Do you refer to our Outlook add-ins or to other add-ins? Are you using Outlook 2013 or an older version? Usually, Outlook 2013 disables an add-in if it takes a lot of time for it to load at startup… no matter if you enable it back, it will get disabled again if it doesn’t load fast enough. It is working fine on other workstations. All have the same Windows 7 and same programs. There must be something not properly selected. The add-in I refer to is Norton 360 Anti-spam. The add-in manager is installed with the trial version of Bells & Whistles. Although you can CHOOSE to purchase Bells & Whistles for $30, you can also choose to uninstall it AND keep the add-in manager. So you don’t have to pay anything in order to use the add-in manager.